A nation-wide network of gifted coaches dedicated to introducing, progressing, and teaching the game of tennis and all of its wonderful qualities. 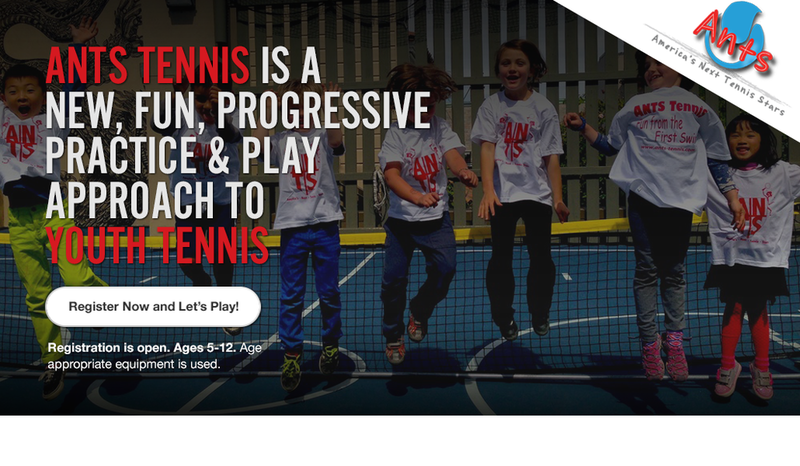 America's Next Tennis Stars (ANTS) is a nationwide network of experienced tennis coaches that are utilizing age-appropriate equipment and coaching philosophies to provide a fun, instructional, and progressive practice and play experience for your players. They are as focused on your child falling in love with the sport of tennis, becoming healthy & confident, just as they are in developing them into a true tennis player! Not only does the modified tennis equipment allow your children to have more fun, but it also allows them to develop better, faster, and with more confidence -- leading to a better all-around experience. ANTS has revolutionized when, where, and how tennis can be played. All of our programs use our "practice & play with most touches possible" philosophy. Your child gets to play 100% of the time-- no substitutes in ANTS Tennis! ANTS is about getting skills up to playing potential as soon as possible so we can have kids learn through both practice and healthy competition. It is proven that if kids play as many times as they practice, improvement increases 4 times faster! Everyone knows the saying, "practice makes perfect" -- so let's practice, play, progress, and have fun!